All residents of the Harrison District Library’s service area, which includes the City of Harrison, Greenwood, and Hayes Townships, and guests from the libraries listed below under "borrowing privileges", are eligible for a free library card. Non-residents may purchase a card for a fee of $100.00 per year. All cardholders in good standing are entitled to borrowing privileges. The Harrison District Library reserves the right to deny privileges to anyone who abuses them. You must present your library card to borrow items. You may present another form of ID if you have forgotten your card. If your library card is lost or destroyed, we will issue you one free replacement. Additional replacement library cards are $1.00 each. Overdue fines exceeding $5.00 must be paid before you may check out materials. If you have lost any library item(s), you must return the item(s) or pay replacement costs before you may check out materials. Materials may be renewed in person, by telephone, or online. Overdue materials may be renewed; however, you are responsible for fines accrued prior to renewal. Library users may check out up to 20 items at a time. New cardholders may check out any two items on their first visit. When these items have been returned, limits are those listed above. Adopted by the Harrison District Library on November 20, 1996. Your Harrison District Library Card entitles you to borrowing privileges at any White Pine Library Cooperative (WPLC) member library. You must present your Harrison library card and proof of correct address. WPLC libraries include: Augres, Bad Axe, Birch Run, Blanchard, Bridgeport, Brown City, Burt, Caro, Cass City, Chesaning, Clare, Coleman, Croswell, Deckerville, East Tawas, Fairgrove, Fostoria, Frankenmuth, Gladwin, Hale, Harbor Beach, Hemlock, Kingston, Lexington, Marlette, Mayville, Millington, Mt. Pleasant, Omer, Oscoda, Pigeon, Port Austin, Port Sanilac, Prescott, Reese, Rosebush, Rose City, St. Charles, Sandusky, Sebewaing, Shepherd, Standish, Tawas City, Thomas Township, Ubly, Unionville, Vassar, Weidman, West Branch, Whittemore, Winn. The Harrison District Library is also a member of the Valley Library Consortium (VLC). Your Harrison District Library Card entitles you to borrowing privileges at the following VLC libraries: Bay County Library System, Grace A Dow Memorial Library (Midland), and the Public Libraries of Saginaw. 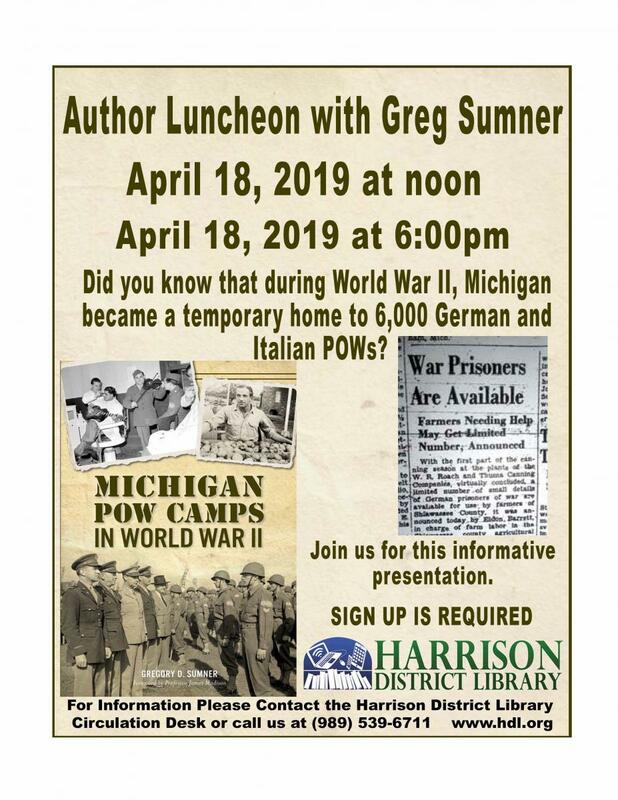 Locally, the Harrison District Library has reciprocal agreements with Pere Marquette District Library (Clare) and Surrey Township Library (Farwell). This policy sets broad guidelines for the selection of library materials that correspond to the library's mission and identified roles. It is also used to guide its library staff and to inform the public about the principles upon which selections are made.